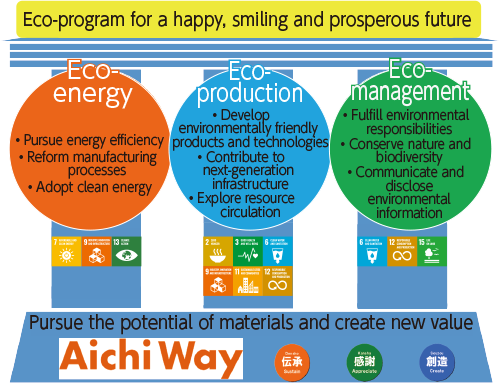 The Behavior Guidelines on Environmental Issues (current Environmental Action Plan) was established in June 1993, and the Aichi Steel Environmental Charter was developed in June 1996, together with which we continuously and actively aim to achieve our goals. In light of increasing global trends to prohibit, restrict, or manage certain chemical substances in products, iIn February 2016 we revised the Aichi Steel Environmental Charter and our management structure in order to strengthen our chemical substances management. As the overall promotion organization, the Environmental Working Group is promoting a variety of activities for environmental conservation through its four subcommittees, the Global Warning Prevention Committee and the Aichi Steel Group Environmental Committee. It is also providing guidance toward achieving our aim of all consolidated subsidiaries with manufacturing sites acquiring ISO 14001 certification. To promote its environmental management activities, Aichi Steel has set up the "Environmental Management Rules." These Rules provide for matters concerning; 1) systems to promote environmental management; 2) compliance/management of the Basic Environment Act and other environment-related regulations; 3) advance assessments of the environmental impacts of products, raw materials, secondary materials and equipment; and 4) support and cooperation for environmental protection in society and communities. Japan’s Nippon Slag Association revised its “Guidelines related to management of iron and steel slag products” on January 14, 2016, in order to strengthen appropriate management of iron and steel slag products. Also, in relation to slag recycled by external intermediate processors entrusted with processing industrial waste, the Japan Iron and Steel Federation revised its “Management Guidelines for Iron and Steel Slag for which Processing is Entrusted to an Industrial Waste Processing Agent” on January 14, 2016. 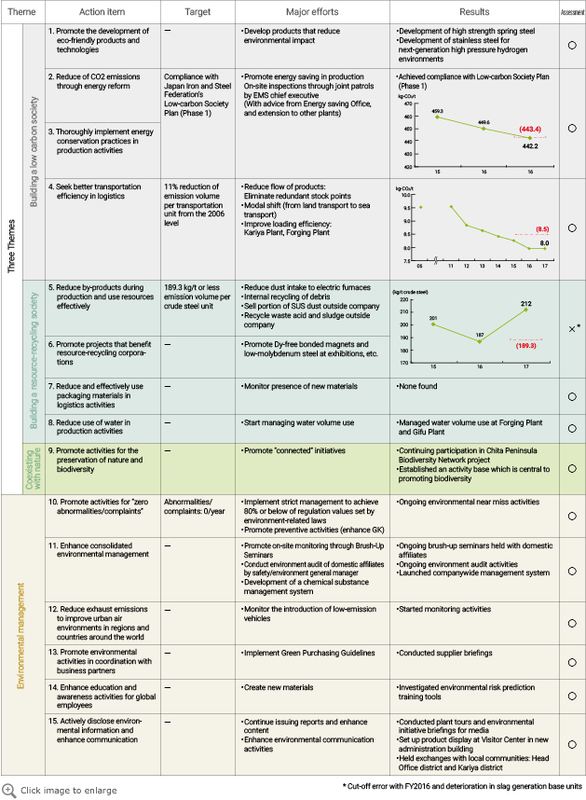 Aichi Steel will continue working to appropriately manage slag and slag products by complying with our management manual in accordance with these two sets of guidelines. The guidelines can be seen on the website of the Nippon Slag Association. In fiscal 2017, 29 additional internal environment auditors, who support the efficient operation of the environmental management system, were certified to bring the total number to 233. Systems have also been established to enable internal audits of all divisions according to ISO 14001:2015. As the results of the FY 2017 internal audit and the surveillance audit of the environment management system, there were no major non-conformance issues. We formulated the Aichi 2020 Environmental Action Plan, a statement of policies and plans for environmental actions from fiscal 2016 to fiscal 2020. The plan adopts three core themes for the direction of our environmental action based on environmental management: building a low-carbon society, building a resource-recycling society and coexistence with nature. By reinforcing management from a global perspective that extends to consolidated subsidiaries, we are contributing, as a sustainable company, to society and the global environment.